Sacha Cosmetics have given us some serious intense colour lipsticks over the past couple years, including brilliant bright colours and matte formulas. In September, Sacha cosmetics launched two new colours to their matte intense lipsticks collection- She’s Royal and Dem Trini Girls! 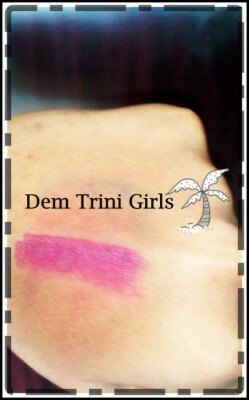 Lets just say, Trini girls have been loving the name choice! This cobaltish blue shade is absolutely stunning! The colour is so beautiful in person, I feel like the pictures really doesn’t do this colour justice. She’s Royal is so pigmented and has great colour payoff, one swipe goes a long way. This shade is for those colour lovers out there that love a bold lip look and trust me, you will not regret this purchase. Sacha Cosmetics Matte Intense Lipsticks have been known to be very mattifying and drying, but the formulation in these two colours are different from the rest. The formulation is matte yet creamy, upon application the lipstick goes on so creamy and does not tug on your lip. In addition, it does not dry out after being on the lips for some time, the lipstick continues to be hydrating and easy on the lips. If you find that its still too dry for your liking just add some lip balm and you’ll be good to go. Just like She’s Royal, Dem Trini Girls is absolutely stunning! This shade is a very deep purple with a deep wine finish. I love this colour because it works great with darker skin and can transition from day to night easily. Again, the formulation is amazing. These colours are super amazing and great quality! Availability: At Pennywise in Arima, they currently have She’s Royal as Dem Trini Girls was sold out. At Pennywise in Trincity, they have Dem Trini Girls and She’s Royal is sold out I am not sure about other Pennywise locations. However, stocks should be replenished soon.